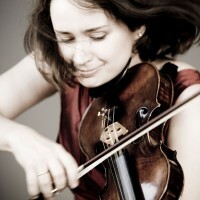 BERLIN -- The first time I saw violinist Patricia Kopatchinskaja perform, it was at Volkswagen's Gläsener Manufaktur in Dresden. She was standing beneath a row of half-built sedans with their engines exposed, playing a program of gypsy-inspired music ranging from Ravel to Bartók. With her mother on violin and her father on cimbalom, she offered a welcome distraction in the sterile setting, even as they tapped their feet to variations on the Balkan dance melody Hora Staccato. Kopatchinskaja brings the same unselfconscious virtuosity and bittersweet quality to more contemporary music. When she came to Berlin last spring to perform Peter Eötvös’ violin concerto Seven with the Deutsches-Symphonie Orchester, she played an encore of selections from Kurtág’s Kafka Fragments, in which she seemed to lock eyes with everyone at the Philharmonie as she recited poetry over swirling violin motives. If she managed to jolt some people, it wasn’t a coincidence. “The audience has become a bit deaf,” she said last September at a café on Berlin’s Gendarmenmarkt. “That’s why one has to even provoke them sometimes, so that they can really listen again. The 36-year-old violinist, sometimes described as an “enfant terrible,” is one of today’s most exciting performers—particularly in the Eastern European repertoire that she holds so dear. Late last month, she made her second American orchestra appearance, performing Bartók’s Second Violin Concerto with the Boston Philharmonic. When we met, her Naïve Classique album of Bartók, Ligeti, and Eötvös—with Eötvös conducting the Frankfurt Radio Symphony—had just been named the Gramophone Recording of the Year. She also includes a Trash Bin for her responses to negative criticism. “I can strongly recommend the multitude of well-raised, well-coiffed girls who take the stage with a seductive air and play the violin perfectly, without any deliberation, reflection or surprises,” she writes to a reviewer who mentioned her unglamorous appearance on Concerto.net. She continues to reside in the Swiss capital with her husband and eight-year-old daughter, whom she admits she doesn’t get to see often enough. In addition to her packed performance schedule, she recently formed the Quartet-Lab ensemble with cellist Peter Wispelwey, violinist Pekka Kuusisto, and violist Lilli Maijala. She also composes, which she says allows her to drain the pent-up musical energy from outside commissions; she is currently working on a violin concerto.